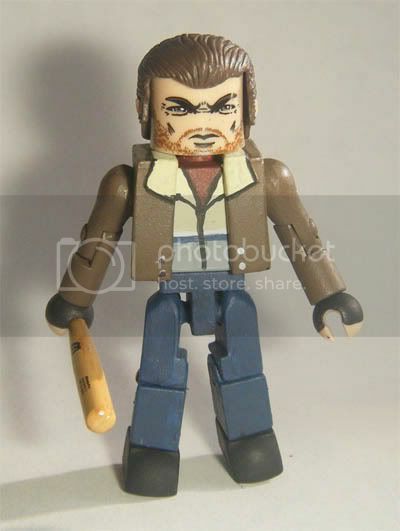 I often find myself searching through old posts on the boards here, trying to find out if anyone had discovered whether a certain accessory, stand, or vehicle is compatible with Minimates or not. So, I thought it might make some sense to pool together all relevant links to threads and other web pages in one place, as a resource for those of us looking for vehicles, dioramas, accessories, stands, etc. 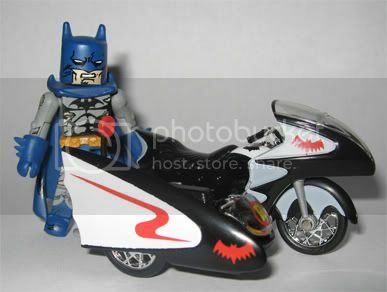 that are compatible with Minimates. I'm sure that I am missing some relevant links (particularly since I've only searched through the "Crisis on Infinite Minimates" section for the threads linked here), so if someone knows of or finds other links, please post them here. Wow that's pretty awesome thanks!!! You know, when I saw this topic, I thought it was something like "could my 24 Nina Myers mate date my Hawkeye mate? They seem to like each other...". This thread is much cooler then that, though! I don't know, that would make for an incredibly bizarre, and thus potentially very interesting, discussion. . . I especially like the downloads (see the link under morale boosters) that has forms, build-your-own fedex boxes, motivational posters and TPS reports that you can print & cut for your mates. This chair looks like it was inspired by Kirk's, which might be useful to someone trying to make a Star Trek diorama. I don't have pictures at the moment, but the GI-JOE Sigma 6 vehicles for the smaller guys ( which are in my warehouse at the moment) work very well with minimates. Also Power Force military action figures (i think that's what they're called) have guns that fit in minimate hands. That one makes me think of Sealab 2021. Those would probably be some pretty easy Minimates to make if you could get the generic orange and blue bodies down. 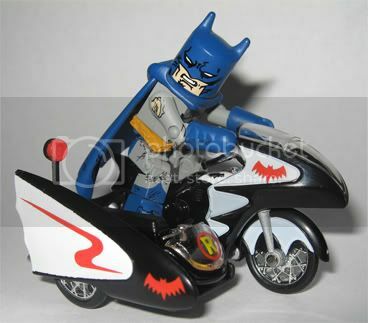 1:18 1966 Batmobile apparently works for Mates! This helpful thread needs to continue! Came across the Ark of the Covenant. Sadly, the top doesn't come off to reveal the sand. But add a couple toothpicks and your Minimates can carry it with them as they please. Made by a company called Takara Neduke, who apparently specializes in charms and key chains. Luckily, what makes this a key chain is an easily removed piece of string. $3.99 at a local comic book store, comes in a capsule. Also in the line were the other artifacts Indiana Jones went after, though they're not in the same scale. 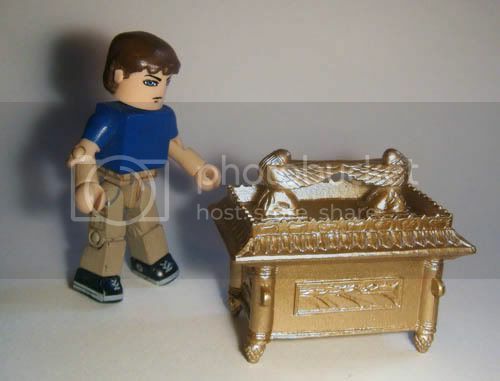 The Friggin Ark of the Covenant? Cape gets in the way just a little bit though. 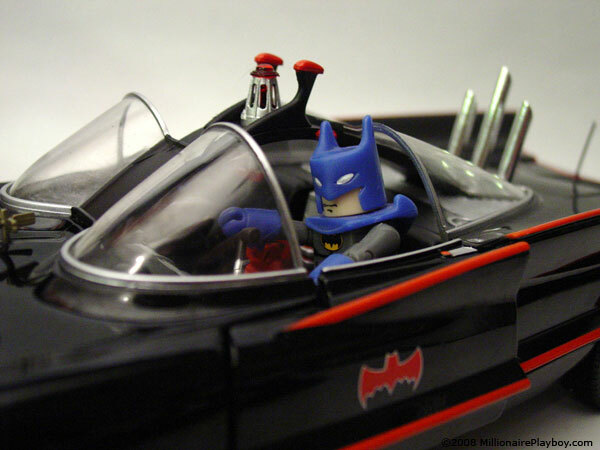 You need to stick Robin in the side-car. Where is that bike from? 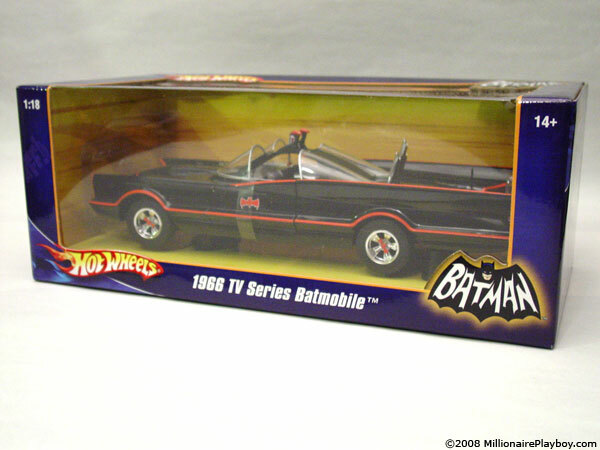 It's from Hotwheels, they have a Batgirl one too, but some of them can be a little pricey on E-Bay. Mcfarlane 3" MLB baseball bats. Cut them off the figure's hands, and glue them back together. Perfect for Mini-thugs!! Now all we need are a mini-crowbar and our street gangs can start causing mayhem!! I suppose you could, you might want to find something bigger though. And keep a few band-aids handy. the GI Joe mass device, fits perfectly for minimates. you can see the control panel in my latest comic The Real World EP 2. Unfortunately, we won't have the entire MASS device until late in the year at the earliest. . .then, I don't think it will be "complete" complete without the tube elements, which seem as if they will only be available with crappy, single carded repaints. But apart from all that, awesome. If someone were to fashion a little chair, I bet the "weather dominator" would work well with Minimates, too. I've got a bunch of stuff on order from a store called Larry G Scale for a big customizing project. 1:24 (or thereabouts) seems to work well with Minimates and I'll throw up some pics when my stuff arrives.